Our 1 Oz Salt and Pepper Shakers have an Eiffel tower shape. Made of glass, their height and style add substance and elegance to your table setting. This item rents in sets of 2 (1 salt/1 pepper) and comes with salt and pepper. 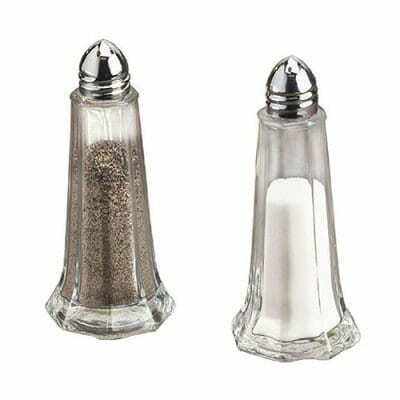 We also carry Mini Salt and Pepper Shakers as an alternate choice of S&P shakers. Sweet and cute, these modern S&P shakers are great for a delicate table design or when space is a concern. Likewise, we carry a tasteful selection of china and tableware in different styles. We rent catering equipment for all occasions. Finally, our celebratory cake stands and serving utensils can provide that polished look to your event. Please inquire about our full range of food service rentals. Please note that Just 4 Fun Party Rentals is a full-service rental company. All quotes will include delivery and installation of equipment. We work with you to arrange the best time for delivery. A reminder of your appointment will be sent to you and you will be alerted of any possible delays. We look forward to seeing you at your event!